Today was our last full day in Australia. We wanted to make it a full day, so we set out on a bus tour of Sydney. 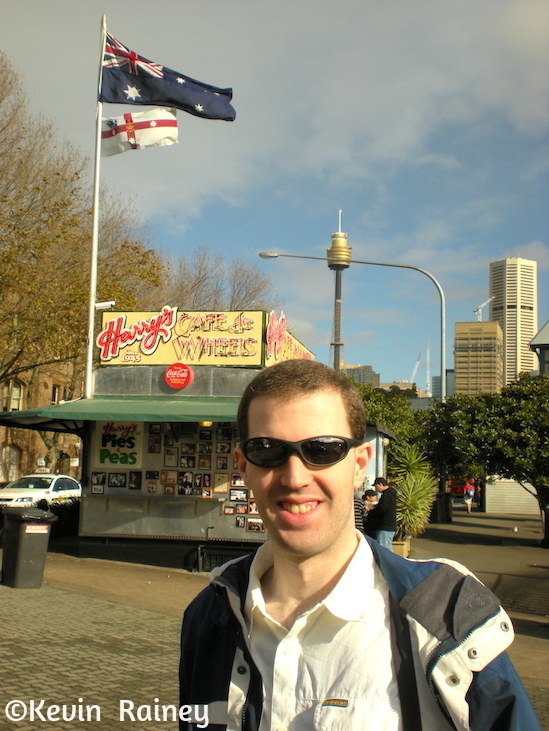 Jeff and I walked down the street from the Marriott to the Circular Quay transit station. For AUD$ 39, we bought two tickets on the hop-on, hop-off tourist bus called the Bondi Explorer. The circuit would take us on a tour to the western parts of the city towards the Pacific Ocean before returning back on a clockwise journey to the city center. You could hop of at 19 stops all day and board the next bus every 20 minutes or so on this blue line. 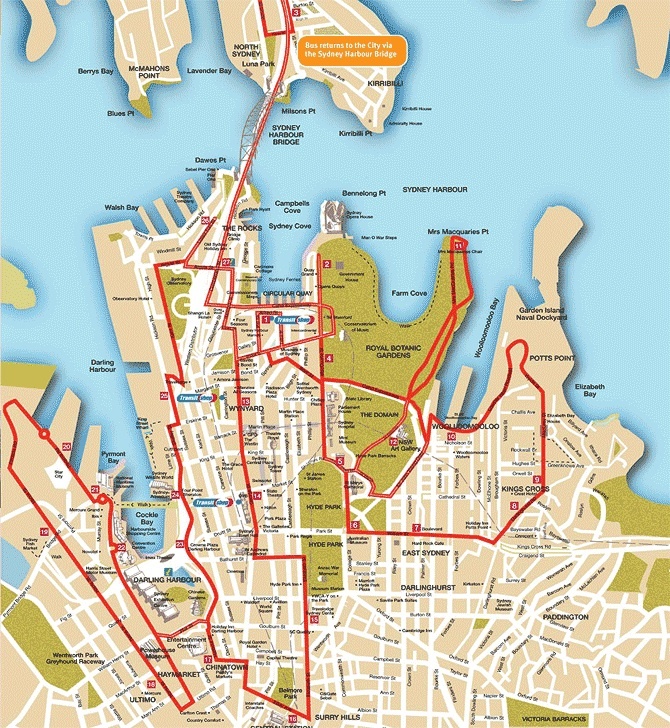 The ticket also entitled us to ride the red line which cover the city center and the eastern side of Sydney. Like San Francisco, Vancouver, Rio de Janeiro and Cape Town, Sydney can certainly be considered one of the most beautiful cities in the world. Beautiful bays seemed to appear out of every turn of the city’s harbor. Not too far away, we disembarked the bus in Woolloomooloo. Jeff wanted to visit Harry’s Cafe de Wheels, a famous pie cart located on Cowper Wharf Road near the Finger Wharf and Fleet Base East of Garden Island Navy Base. The bus/van is now permanently fixed on a masonry base with caravan walls decorated with custom painted murals. We saw pictures of famous visitors such as Frank Sinatra, Colonel Sanders, Nicole Kidman, Bono and Bizarre Foods host Andrew Zimmern. Jeff ordered their famous Tiger pie which we shared. The dish, named after our founder Harry ‘Tiger’ Edwards, has chunky lean beef pie served with mushy peas, mash & gravy. 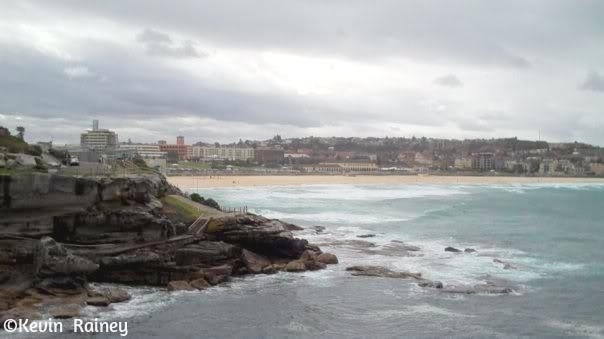 After the “breakfast” pie, Jeff and I hopped back on the Bondi Explorer and headed towards Bondi Beach. Along the way, we stopped at The Gap. Here we had to see the opportunity to for a remarkable view of distant central Sydney from the South Cape and entrance to the Pacific Ocean. We hiked a beautiful coast trail above see cliffs overlooking the ocean at The Gap Park. Later, we saw the Macquarie Lighthouse after rejoining the bus before passing Diamond Bay. Then we soon arrived in Bondi, home of world famous Bondi Beach. It reminded me of some of the Pacific beaches in California, but was beautiful in its own right. We bought some souvenirs and explored some shops before touring the beach. Since this was the winter, there weren’t many tourists out in the water, but we did see some surfers in wetsuits out surfing. 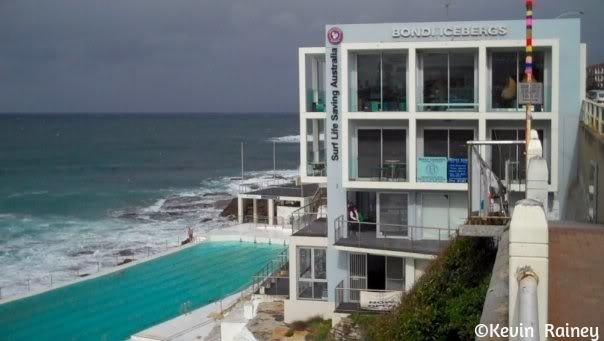 We toured the Bondi Icebergs sea pool, which reminded me of the Cliff House in San Francisco. Not too far away on the boardwalk, we had a celebrity sighting! We saw British actress Sienna Miller walking out with her friends and a guard, of course wearing her sunglasses. 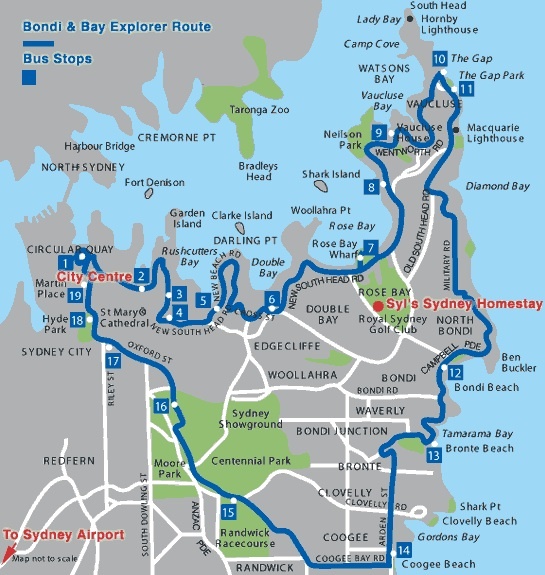 After enjoying Bondi, we rejoined the Bondi Explorer Bus and road back to the city center. We got off at Hyde Park and boarded the Sydney Explorer (Red line) to see the western side of Sydney. We traveled past Chinatown and Haymarket before stopping at the Sydney Fish Market for a late lunch of seafood platters. It was huge and saw a diverse catch of fish and seafood in the market. Then we boarded the bus and passed the soaring Anzac Bridge in Pyrmont by beautiful Darling Harbour, home of the Sea Life Aquarium. As we rounded around Darling Harbour, we approached the Harbour Bridge from the west and passed The Rocks before arriving back at Circular Quay. Back in the Central Business District, we explored the financial heart of Sydney. We grabbed supper outside on the patio of Ryan’s Bar. Much of the crowd was made up of young professionals hitting happy hour after a long workweek. It was extremely crowded and I couldn’t believe how many people were meeting for drinks after work in their suits. Jeff and I had some sandwiches. Then we walked down Market Street and decided to ride to the top of the Sydney Tower, Sydney’s tallest building and the third tallest in Australia. At 1,014 feet, it is the second tallest observation tower in the Southern Hemisphere after Auckland’s Sky Tower. We saw the city during a beautiful sunset, saw the Pacific Ocean to the east and caught a glimpse of the Blue Mountains in the west. To finish the evening, we walked down Market Street back to Sydney Harbour. At Circular Quay, we boarded a municipal that evening with a number of business commuters. We traveled under the Harbour Bridge for the first time and realized how massive it is. We were impressed with how beautiful the city’s skyline was looking back at Circular Quay, the Sydney Opera House and the skyscrapers. 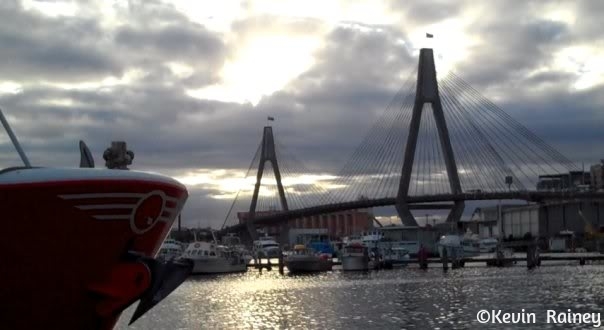 We traveled to the Woolwich ferry port before turning around back to central Sydney. We enjoyed the nocturnal view of the Sydney Opera House and the Harbour Bridge impressive lit in Sydney Harbour. We grabbed some more chocolate gelato at Circular Quay before walking back to the Marriott to pack. We made our last full day count in Sydney!